Provide complete and lasting relief. What is the Conventional Treatment for Headaches and Migraines? Are you addicted to synthetic painkillers? How has Migone Plus helped others? What does Migone Plus contain? How do I use Migone Plus? Is there anything else I can do to help myself? Doctors have different theories about the causes of migraines and headaches. Most doctors agree, however, that they have multiple causes and that it is important to do a thorough examination if you have recurring headaches. Low blood sugar levels and dehydration can also bring on headache, especially if you have skipped a meal. In naturopathic medicine, headache and migraine is seen as a 'toxic' condition and a signal from the body that there is an imbalance in organ functioning. Naturopaths will treat the condition, rather than the symptom only and the goal is therefore to restore health and proper organ functioning, not only to relieve pain symptomatically. Prescription painkillers and synthetic drugs used to treat migraine and chronic headache may reduce the pain associated with these conditions, but do not address the causes. This means that the person must continue to suffer and be dependent on the use of painkillers. The 'rebound effect' of many painkillers is well-known but seldom discussed in medical circles. In essence, the 'rebound effect' means that continued use of some synthetic painkillers can be the cause of future headaches, making the person dependent on the drug indefinitely. The chemicals in synthetic drugs can also accumulate in the liver, reducing liver functioning and overall health - often causing more frequent headaches. Many synthetic painkillers contain chemicals that can result in dependency, which leads to daily use of the drug and withdrawal effects when it is stopped. This is both expensive and very bad for one's health. The effects of long term and regular use of some synthetic painkillers are not yet fully researched. Anyone who finds themselves needing to take prescription and OTC painkillers regularly should consult their health care practitioner for help. The importance of diet and lifestyle cannot be stressed enough. A healthy diet and regular exercise help to keep your body and mind in tip-top shape, maintaining healthy circulation, reducing the effects of stress and helping to keep all body systems in good shape. In this way, the muscles in the shoulder, neck and head area are kept supple and blood is kept flowing to these areas, helping to relieve common tension. It is also important to eat at regular intervals during the day to sustain healthy levels of sugar in the blood, and to drink at least 8 glasses of water per day to keep the brain hydrated. Always avoid skipping meals. Natural remedies have been used for generations to support a healthy brain, nervous system, circulatory and liver functioning and can be of great benefit for maintaining health in these areas! Migone Plus is especially formulated by a Clinical Psychologist and is a concentrated medicinal extract of three herbs especially chosen to address three of the principle underlying causes of chronic headache and migraine - liver dysfunction, stress and circulation problems. Migone Plus does more than just remove pain in the short term and is formulated to treat the underlying causes of headaches and migraine. Regular use can result in a significant reduction in the frequency and intensity of chronic head pain. "After years of headaches I tried MiGone. I am now completely off the pain tablets for the first time since I can remember"
"I had (stress induced) migraine headaches at least once a week ever since my son was born 3 1/2 yrs ago. The pain was horrible causing my life to stop for hours at a time. I was on 2 prescription medications costing approx. $316/month (I have no med insurance), and I still got the headaches. I tried Migone Plus about 5 months ago. I figured what could I lose. I did exactly as they said, and I am happy to say I have been migraine free for about 4 months now. I never thought it could be possible that something so affordable could do what those expensive prescriptions couldn't. Thank you so much for such a wonderful product!" "Thank you for your wonderful products, especially Mi-Gone Plus! I have been a sufferer of cluster headaches since my teens and no-one could find the cause. The money I spent on pain medication was no joke and it always made me feel sick the next day. Since taking a course of Mi-Gone I have only had one attack, which was quite mild and went away sooner than usual." "I wanted to write and recommend Mi-Gone Plus to anyone who suffers from migraine like I do. It has made a tremendous difference!" "I have recently used your Natural products for severe headache/migraine. For many months I have been trying various drugs etc, and have in fact been referred to a specialist because of the lack of relief I have received from these drugs. I decided to ship to England your products, I have combined the Migone Plus with PureCalm and have received an amazing relief from my problems. I have used the products for three weeks and they have changed the quality of my life completely. I wholeheartedly endorse these products, and have become an Affiliate of this company. Thank you!" "Julia (married, 33 years old) came to see me on the advice of her doctor. She was suffering from recurring headaches and migraines. Medical investigation revealed no obvious cause and her doctor was concerned that Julia's headaches were psychological in origin. During her first consultation, she told me that she was taking over-the-counter painkillers on a daily basis and found that she needed stronger and stronger tablets to ease the pain of her headaches. Apart from the stress related to caring for a young family, Julia did not seem to have any particular problems which could be causing her chronic headaches and migraines and there was no sign of an underlying problem from her childhood. I told her about the 'rebound effect' of painkilling tablets and that it was possible that the very medication that she was taking to relieve her headaches was also causing them to recur. Together, Julia and I decided that we would beat her headaches once and for all! I put her on a detox diet and recommended that she take Migone Plus daily, cautioning her that it might take a month or more for her to see positive effects. During the first week, Julia's headaches continued and she used PureCalm to relax and help with the pain. By the second week, her headaches were less frequent and much less severe and Julia was beginning to see light at the end of the tunnel. When she visited me at the end of the fourth week, Julia had experienced only one mild headache in the previous 10 days and she was really feeling the benefits of the detox diet! At her three months follow up visit, Julia was headache free and very proud of herself! It just goes to show that, even though headaches and migraines are often caused by psychological factors, this is not always the case. Had Julia's doctor been more knowledgeable about herbal medicines, he may have been able to save her a trip to the psychologist!" Tanecetum parthenium (Feverfew) is a well-known medicinal herb and one of the most widely respected in the prophylactic (preventative) treatment of migraine and chronic headache. There are many clinical studies to support its effectiveness in significantly reducing or completely eliminating the occurrence and the severity of chronic headache and migraine. Scientific research has demonstrated that Feverfew contains a range of compounds called sesquiterpene lactones, the principle ingredient being parthenolide. Parthenolide has been scientifically shown to prevent excessive clumping of blood platelets and to reduce the release of certain pain inducing chemicals and inflammatory compounds. It has also been shown to make smooth muscle in the walls of cerebral blood vessels less reactive to vaso-constrictors - thereby relaxing constricted blood vessels and increasing blood flow to the brain. Silybum marianus (Milk Thistle) is regarded as one of the most important herbal liver tonics and restoratives. As is the case with Feverfew, medical use of Milk Thistle may be traced back more than 2000 years. Like Feverfew, Milk Thistle has been subject to many clinical trials which clearly demonstrate its effectiveness. It is frequently recommended to counteract the harmful effects of alcohol and other drugs on the liver and clinical studies have shown that it helps the liver to return to normal functioning once drinking has stopped. Scientific analysis of Milk Thistle shows that it contains a flavonoid complex called silymarin, which is largely responsible for the medical benefits of this herb. Silymarin is a powerful anti-oxidant and can block the entrance of toxins into the liver and remove toxins at cellular level, thereby resulting in regeneration of liver cells and improved liver functioning. This would have a direct impact on overall systemic health as the liver is one of the most important organs in the body. Passiflora incarnata is a tropical herb which has been used since the 19th century for nervous conditions. Modern research supports traditional usage and clinical trials have demonstrated the relaxing and anti-anxiety effects of Passiflora. Passiflora is often recommended to treat anxiety and reduce tension and is also very useful in reducing the withdrawal symptoms of recovering drug addicts and alcoholics. Medical analysis has shown that Passiflora contains flavonoids which are responsible for its calming and anti-anxiety effects. 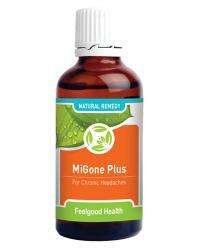 Migone Plus must be used daily to prevent the occurrence of chronic headaches and migraine. An initial six weeks course is recommended at full dosage, followed by a further six weeks at half dosage. Some people may need a repeat course once or twice a year, depending on lifestyle and dietary factors. An additional dose may be taken at the early onset of migraine or headache. This often stops the pain in its tracks. Use Migone Plus with StudyPlus for headaches linked to a heavy study load. Mi-Gone Plus is not a pain killer, nor is it a short term solution to headaches and migraine. It must be taken regularly as a long term solution and can take 6 - 8 weeks to show full results, although improvement is often noticed earlier in the form of fewer and less intense headaches. Have regular breaks and walk around for a few minutes every hour if your job involves sitting at a computer all day. Makheja AN, Bailey JM. A platelet phospholipase inhibitor from the medicinal herb feverfew (Tanacetum parthenium). Prostagland Leukotrienes Med 1982;8:653–60. Heptinstall S, White A, Williamson L, Mitchell JR.. Extracts of feverfew inhibit granule secretion in blood platelets and polymorphonuclear leukocytes. Lancet 1985;1:1071–4. Awang DVC. Parthenolide: The demise of a facile theory of feverfew activity. J Herbs Spices Medicinal Plants 1998;5:95–8. Johnson ES, Kadam NP, Hylands DM, Hylands PJ. Efficacy of feverfew as prophylactic treatment of migraine. Br Med J 1985;291:569–73. Murphy JJ, Heptinstall S, Mitchell JRA. Randomised double-blind placebo-controlled trial of feverfew in migraine prevention. Lancet 1988;2:189–92. Palevitch D, Earon G, Carasso R. Feverfew(Tanacetum parthenium) as a prophylactic treatment for migraine: A double-blind placebo-controlled study. Phytother Res 1997;11:508–11. De Weerdt CJ, Bootsma HPR, Hendriks H. Herbal medicines in migraine prevention. Phytomed 1996;3:225–30. Wagner H, Horhammer L, Munster R. The chemistry of silymarin (silybin), the active principle of the fruits of Silybum marianum (L.) Gaertn. Arzneim-Forsch Drug Res 1968;18:688–96. Hikino H, Kiso Y, Wagner H, Fiebig M. Antihepatotoxic actions of flavonolignans from Silybum marianum fruits. Planta Medica 1984;50:248–50. Faulstich H, Jahn W, Wieland T. Silibinin inhibition of amatoxin uptake in the perfused rat liver. Arzneim-Forsch Drug Res 1980;30:452–4. Tuchweber B, Sieck R, Trost W. Prevention by silibinin of phalloidin induced hepatotoxicity. Toxicol Appl Pharmacol 1979;51:265–75. Feher J, Lang I, Deak G, et al. Free radicals in tissue damage in liver diseases and therapeutic approach. Tokai J Exp Clin Med 1986;11:121–34. Sonnenbichler J, Zetl I. Stimulating influence of a flavonolignan derivative on proliferation, RNA synthesis and protein synthesis in liver cells. In Assessment and Management of Hepatobiliary Disease, ed. L Okolicsanyi, G Csomos, G Crepaldi. Berlin: Springer-Verlag, 1987, 265–72. Salmi HA, Sama S. Effect of silymarin on chemical, functional and morphological alterations of the liver. Scand J Gastroenterol 1982;17:517–21. Ferenci P, Dragosics B, Dittrich H, et al. Randomized controlled trial of silymarin treatment in patients with cirrhosis of the liver. J Hepatol 1989;9:105–13. Velussi M, Cernogoi AM, De Monte A, et al. Long-term (12 months) treatment with an antioxidant drug (silymarin) is effective on hyperinsulinemia, exogenous insulin need and malondialdehyde levels in cirrhotic diabetic patients. J Hepatology 1997;26:871–9. Pares A, Plancs R, Torres M, et al. Effects of silymarin in alcoholic patients with cirrhosis of the liver: results of a controlled, double-blind, randomized and multicenter trial. J Hepatol 1998;28:615–21. Nassuato G, Iemmolo RM, Strazzabosco M, et al. Effect of silibinin on biliary lipid composition. Experimental and clinical study. J Hepatol 1991;12:290–5. Palasciano G, Portinascasa P, Palmieri V, et al. The effect of silymarin on plasma levels of malondialdehyde in patients receiving long-term treatment with psychotropic drugs. Curr Ther Res 1994;S5:S37–45. Allain H, Schück S, Lebreton S, et al. Aminotransferase levels and silymarin in de novo tacrine-treated patients with Alzheimer’s disease. Dementia Geriatr Cogn Disorders 1999;10:181–5. Meier B. Passiflora incarnata L.—Passion flower: Portrait of a medicinal plant. Zeitschrift Phytother 1995;16:115–26. Wichtl M. Herbal Drugs and Phytopharmaceuticals. Boca Raton, FL: CRC Press, 1994, 363–5. Newall CA, Anderson LA, Phillipson JD. Herbal Medicines: A Guide for Health-Care Professionals. London: Pharmaceutical Press, 1996, 206–7. Fight common headaches plus stronger remedy to ward off Migraines! Remedy to combat migraines plus underlying depression!